This is a bridal album page design feature the beach wedding ceremony at the house of refuge in stuart florida. 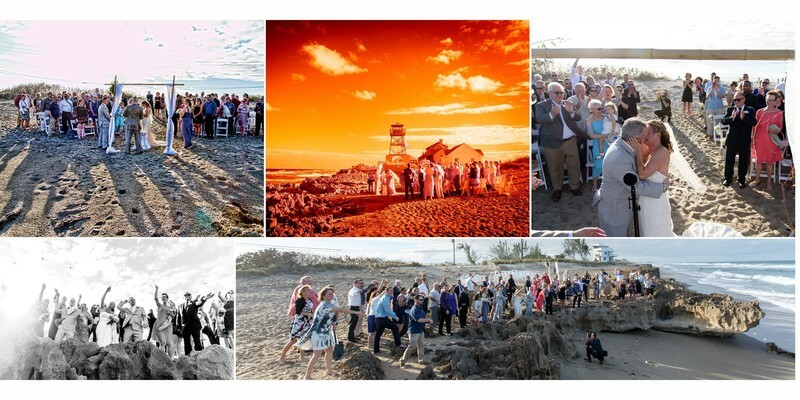 Also we have done a few things differently including the use of a non traditional aspect ration for the bottom right image that is a great panorama of the entire wedding guests and all sharing in a shell toss ceremony. You can actually see me in the shot kneeling down in front shooting up at them while my second photographer took this dynamic shot. Also is a cool strawberry wine flavored infrared photo of the ceremony at the house of refuge. We love to integrate our IR work with the visible light captures to really make your wedding stand out.